Heartworm disease (HWD) is one of the most important and complex diseases addressed in veterinary medicine, and its persistence continues to confound veterinarians, researchers, and pharmaceutical companies. During the American Heartworm Society (AHS)’s 15th Triennial Heartworm Symposium, which took place September 11 to 13, 2016, in New Orleans, changes in climate, heartworm vectors, prevention practices, and treatment protocols were all highlighted as important reasons to continue expanding HWD knowledge. Vector epidemiology, climate influences, and mosquito-blocking activity. Is heat treatment of serum samples necessary? Since the 14th Triennial Heartworm Symposium in September 2013, heat treatment of serum samples—a routine practice in the days before point-of-care commercial antigen tests became available—has been a topic of some debate. At issue is the fact that commercial heartworm antigen tests can produce false-negative results when circulating antibodies bind to heartworm antigen, rendering the antigen unavailable for detection. Speakers included Drs. Rick Alleman, James Carmichael, Brian DiGangi, Laura Kramer, Norma LaBarthe, Lindsay Starkey, and Luigi Venco, and topics included the pros and cons of heat treatment of serum samples and a comparison of commercial antigen tests. While time of testing and stage of infection may each play a role, the importance of these findings is not yet clear. In several presented studies, a small but significant percentage (5%–10%) of negative samples converted to positive with heat treatment. These data suggested that (1) timing of testing may be important and (2) false-negative results may be more likely in the early stages of infection and after exposure to macrocyclic lactones. Not every dog with a negative result on an antigen test should have its serum sample heat treated. Performing this extra step may be beneficial when microfilariae and/or heartworm clinical signs are present in dogs that test negative on a commercial antigen test. Heat treatment does not determine presence of live worms or efficacy of therapy. A positive result on a heartworm antigen test performed on a heat-treated sample does not reflect a live worm test, and heat treatment of serum should not be used to determine the success or failure of adulticidal therapies. How do current antigen tests hold up when compared with the “gold standard” tests? The commercial heartworm antigen tests available to veterinary practitioners are believed to be highly accurate. 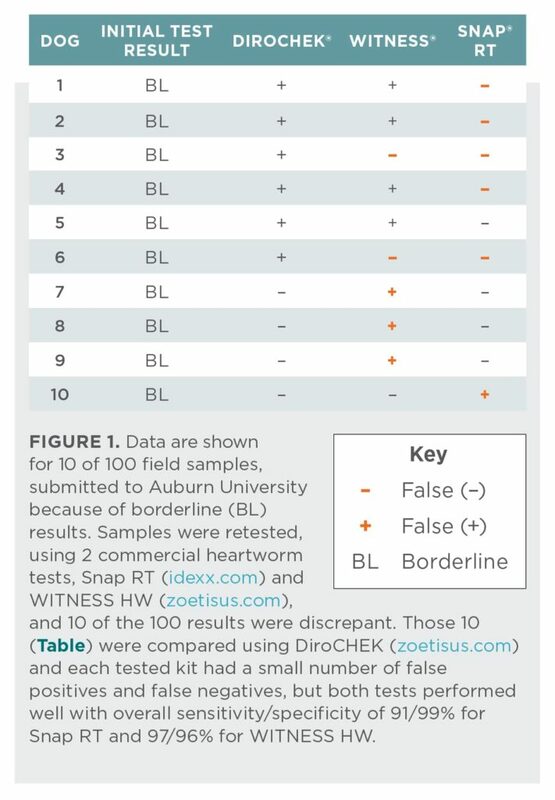 However, a study from Auburn University found discrepant results in 6.6% of samples tested with the SNAP Heartworm RT (idexx.com) and Enhanced WITNESS HW (zoetisus.com) tests compared with the enzyme-linked immunosorbent assay DiroCHEK heartworm antigen test (zoetisus.com), the accepted “gold standard,” with some minimal differences between the 2 commercial tests (Figure 1). How do the effects of heartworm infection affect approach to therapy? Understanding how heartworm infection affects the animal is key to devising treatment strategies that minimize adverse events. Speakers on this topic included Drs. Ray Dillon, Elena Carretón, Changbaig Hyun, and Randolph Winter. Topics included the cardiopulmonary effects of heartworm byproducts in the circulation of dogs, cats, and rats and the evaluation of inflammatory biomarkers in dogs with HWD both before and after adulticidal treatment. Future treatment may be based on blocking the effects of byproducts of heartworm death. Undefined byproducts from living and dead heartworms produce harmful consequences. An Auburn University study among dogs, cats, and rats found these byproducts induced systemic hypotension, cardiogenic shock, edema of type 1 pneumocytes, and loss of capillary integrity in dogs. The effects were much milder in cats and almost nonexistent in rats. Finding ways to block the effects of heartworm death in dogs and cats may form the basis of an important disease management strategy in the future. Dogs with more severe clinical signs of heartworm infection had higher levels of cardiopulmonary and inflammatory biomarkers. Thus, they were likely at greater risk for adverse events associated with adulticidal therapy. Administration of melarsomine caused some biomarkers to rise, then fall, while others remained at elevated levels for some months after treatment. Researchers postulated that pretreatment with macrocyclic lactones and doxycycline before melarsomine (per the AHS protocol) may reduce myocardial damage and vascular inflammation. On the basis of these results, 2 investigators questioned the necessity of routine administration of steroids to asymptomatic dogs around the time of treatment. While little work has addressed the utility of evaluating inflammatory biomarkers in cats with HWD, a recent study reported that seropositive cats had significantly higher concentrations of positive acute phase proteins, serum amyloid A, haptoglobin, and ceruloplasmin. Is there a new alternative in the treatment of heartworm infection? While adulticidal treatment of heartworm infection using melarsomine is considered the standard of care in the U.S, not every dog is a candidate. Reasons to consider alternative adulticide protocols include limited availability of melarsomine (the drug is completely unavailable in some countries), prohibitive expense for some owners, and the dog’s inability to withstand the potential complications of adulticidal treatment. Varying opinions on different treatment protocols sparked lively discussion during coverage of studies on nonarsenical heartworm treatment protocols, minocycline versus doxycycline in heartworm treatment protocols, and the susceptibility gap in treatment of canine heartworm infections. Speakers on this topic included Drs. Marisa Ames, Dwight Bowman, Michael Dzimianski, Claudio Genchi, Changbaig Hyun, Laura Kramer, Mark Papich, and Molly Savadelis. Adulticidal protocols using moxidectin/imidacloprid and doxycycline are under investigation. “Slow kill” protocols with macrocyclic lactones are considered undesirable because they allow disease progression during this prolonged therapy and potentially add to the risk for resistance. Researchers presented studies from Colorado State University, the University of Parma in Italy, and the University of Georgia on protocols that incorporate the combination of doxycycline and moxidectin/imidacloprid, which is both microfilaricidal and adulticidal. Protocols and success rates varied, but results were overall promising. Minocycline may be an alternative to doxycycline. Minocycline, like doxycycline, is a tetracycline that has been considered as an alternative antibiotic choice when doxycycline is not available. While more work is needed to document its efficacy for treating canine HWD and, specifically, its anti-Wolbachia activity, several potential advantages include better absorption with oral administration, better tissue distribution, and better intercellular penetration. When administered to dogs, it should be given before feeding at the same dosage recommended for doxycycline. The validity of the “susceptibility gap” was questioned. The “susceptibility gap” in dogs with adult heartworms is the period in which heartworms are not susceptible to macrocyclic lactone preventives or the adulticide melarsomine, based on product labels. Because melarsomine has some degree of efficacy against 4-month-old worms, it was postulated that combining melarsomine with macrocyclic lactones at the outset of treating heartworm-positive dogs may eliminate this gap; the author questioned the merits of delaying adulticidal treatment to allow further maturation of tissue-stage larvae. The current pre-adulticide delay, advocated by the AHS, is not meant to close the susceptibility gap but to allow the “wolbachiostatic” effects of doxycycline to have a longer period to degrade the adult heartworm, thereby enhancing the protective effects of doxycycline on postadulticidal pulmonary insult. Furthermore, the use of doxycycline has essentially “closed” the susceptibility gap, eliminating tissue-dwelling L3 and L4 larvae and 50% of immature adults during the first 60 to 90 days of infection. What is the current status of heartworm resistance? The topic of heartworm resistance headlined the 14th Triennial Symposium and continues to be an area of high interest and importance. Presentations at this year’s conference focused on trends in LOE reports, the importance of resistance in today’s veterinary practice, genetic profiles of potentially resistant isolates, and practitioner identification of potentially resistant isolates. Speakers on this topic included Drs. Clarke Atkins, Catherine Bourguinat, Dwight Bowman, Timothy Geary, Ray Kaplan, Tom McTier, Andrew Moorhead, Roger Pritchard, and Adrian Wolstenholme. The majority of LOE claims are not valid. Approximately 45,000 unsubstantiated macrocyclic lactone LOE claims have been reported to the U.S. Food and Drug Administration Center for Veterinary Medicine, with the largest numbers reported between 2008 and 2010. Most affected animals were age 1.5 to 4 years. The validity of LOE reports has been questioned; most reimbursement claims were invalidated after careful scrutiny of medical records and product purchase history. Of the small percentage of LOE claims that have received an FDA-causality score, just 20%, year-to-year, have been graded as a 6 on a 0-to-6 scale (a score of 6 indicates strong evidence of drug failure). That percentage appears to be falling, with just 10% of claims graded as 6 over the past 4 years. Heartworm resistance reports are declining. Frequency of storm activity in the most heavily heartworm-endemic areas (eg, the Mississippi Delta) has recently been low. Storms are postulated to have been a factor in past years, when heavy hurricane activity precipitated increases in mosquitoes and mosquito diversity, abandoned dogs, dogs without housing, inadequate heartworm prevention, and, ultimately, HWD incidence. The role of recognized macrocyclic lactone resistance in the heartworm epidemic of 2005 to 2014 (but not the existence of resistance) was questioned. A new approach to identification or resistance in suspect cases was presented. Practitioners concerned that they may be seeing resistant cases in their practices can use a new clinical decision tree created at the University of Georgia College of Veterinary Medicine. The step-by-step process includes careful review of the case records to verify gaps in prevention. If suspicion persists, practitioners are advised to quantitate microfilariae and then perform a microfilaria suppression test. The test administers ivermectin (50 µg/kg) or milbemycin (1 mg/kg) with retesting 7 days later. If microfilariae are eliminated, the odds of a resistant biotype being involved are extremely low. Meanwhile, when microfilariae are not significantly suppressed (< 75% reduction), the suspicion of resistance increases. Studies evaluating heartworm resistance are ongoing. Heartworm resistance is a real, but complex, phenomenon that does not follow known patterns of resistance development. Although specific genetic markers for resistant heartworms remain elusive, studies to understand the genetic factors involved in heartworm resistance are ongoing and may offer future strategies for predicting heartworm resistance or susceptibility to preventives. The AHS’s 15th Triennial Heartworm Symposium was attended by scientists and clinicians from 13 countries and 29 states and had 37 speakers from seven countries. To read a symposium snapshot, visit heartwormsociety.org/images/2016_AHS_SymposiumCB.pdf.. In addition, the AHS website and YouTube page feature videos of interviews with several symposium speakers and moderators, including Drs. Clarke Atkins, Byron Blagburn, Dwight Bowman, Ray Dillon, Ray Kaplan, Laura Kramer, Tanja McKay, and Matthew Miller. These videos can be viewed at youtube.com/user/americanheartworm. Scientific papers from the symposium will be published in a future issue of the Journal of Veterinary Parasitology. AHS members can access all past symposium proceedings free of charge. To join the AHS, visit heartwormsociety.org/membership/join. What have we learned about heartworm transmission and prevention? This session assembled the most diverse group of experts, with presentations on entomology, parasitology, human malarial research, microclimate data, and the role of mosquito blocking in heartworm prevention. Speakers on this topic included Drs. John McCall, Tanja McKay, Tom Nelson, Audrey Odom, and Michael Povelones. Our understanding of the dynamics of heartworm transmission by mosquitoes continues to evolve. More than 20 species of mosquitoes in the U.S. today can carry heartworm, and each has a different habitat and behavior—some feed at night and others during the day; some live where they emerge, while others travel; some live in rural areas and outdoors, while others prefer urban areas and indoor habitats. Certain mosquito species that carry heartworm, such as Aedes aegypti and A albopictus (Figure 2), are also known to carry human pathogens, such as the Zika virus. Figure 2. 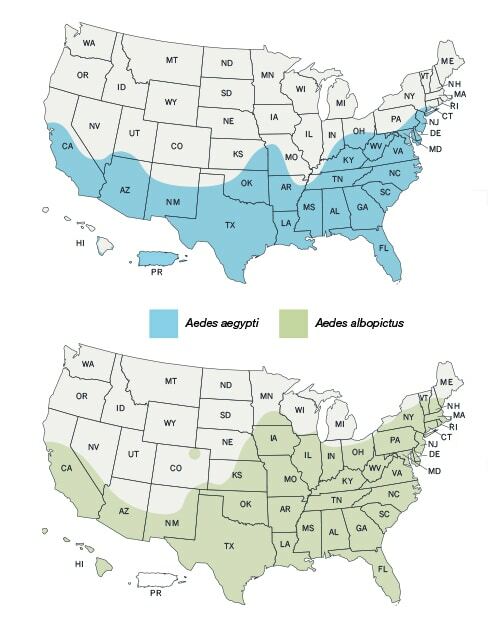 These maps, courtesy of the Centers for Disease Control, represent the best estimate of the potential range of Aedes aegypti and Aedes albopictus in the United States. Reprinted from the U.S. Department of Health and Human Services, Centers for Disease Control and Prevention. A multimodal approach to heartworm prevention is recommended. A multimodal heartworm prevention approach, which, in addition to behavioral and housing modification, combines traditional preventives and repellents-insecticides. This approach is achieved by (1) deploying macrocyclic lactone compounds and (2) blocking both the transmission of microfilariae to mosquitoes and the transmission of the infective stage of Dirofilaria immitis to dogs through the use of the next generation of topical repellent-insecticides. Studies of malaria transmission may suggest avenues of HW research. Studies on the spread of malaria, a human mosquito-borne disease, may offer potential areas of future study of mosquito-borne HWD. Human studies indicate that mosquitoes are more likely to feed on individuals with malaria, based on the presence of terpenes, volatile organic compounds that attract mosquitoes. This finding could lend itself to strategies for both disease detection and prevention.